This personal report references the UFO Casebook case file, RAF Boulmer Reports of UFO Sightings were Hushed Up, July 1977. I witnessed this episode along with some friends. I’ve never spoken publicly before about it but feel I should put this on the record. I was aged 12-years old at the time and was playing with a skateboard my friends and I made out of a plank of wood and an old pair of roller skates in Meadowriggs, Alnwick Northumberland. Meadowriggs is right at the top of the town and has clear views across the countryside towards RAF Boulmer which is about five miles from the town. At the time the base had highly visible radar arrays which you could see clearly from Alnwick. On the night in question, it was still light and the sky was clear, but it was heading towards sunset. There was a low moon in the sky, making it appear bigger. I remember that its colour appeared more red-gold than bright white and it seemed to merge somewhat into the sky itself which across the horizon was red and yellows. I like sunsets and that’s why I looked at the moon – I was waiting my turn for another go of the skateboard – and the beautiful moon was the first thing I saw before I then noticed the discs. I shouted to my friends to take a look and they saw the two big discs in the sky. From our perspective standing at the top of Meadowriggs the moon was above RAF Boulmer and the two discs were above the moon. The discs were not flat – as if you were looking at a plate side on – but if you were looking at a plate face on. The discs were brighter than the moon, and seemed to be shining from their own light, sort of luminous. They just hovered there not moving and my friends and I speculated what they could be. One of my friends M. (now unfortunately deceased from cancer) lived just across from where we were playing. We ran and pointed out the discs to his father who suggested that they were most likely something that the RAF was doing. I think he suggested they might be some new kind of flare or something. He went back to his gardening and we went back outside and had another good look at the discs. What I remember is one of these discs suddenly moving up and down in the sky above the base on a vertical plane. The other seemed to just hover in the same spot. This one – the hovering one – suddenly seemed to zip at extreme and incredibly high speed from my perspective off in a roughly westerly direction. The other stayed for a few more moments before it too took off at extreme high speed. The whole episode lasted for maybes half-an-hour; (it is difficult to say how long they were there because I don’t know how long it was before we first noticed them). I recently contacted two of my friends who were there with me J. and A. at the time of the sighting. They remembered the incident, but I do not know if they would be willing to go on record about this (I would appreciate it if their names were not used without their permission. I can ask them if you are interested if they would be willing to talk). Being youngsters at the time we kind of dismissed the whole episode and continued playing on our home made skateboard and it didn’t frighten us or really faze us either. 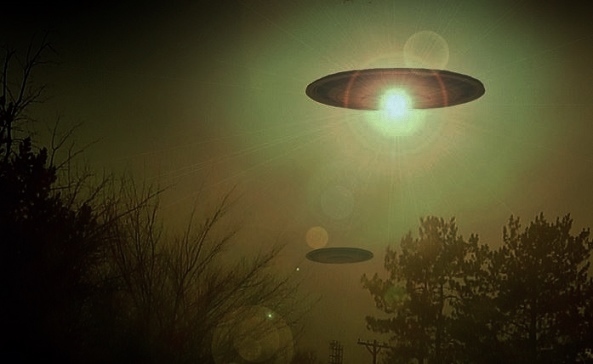 Although we did speculate they were UFOs, M.’s dad’s explanation was semi-accepted. In 1940 a decoy airfield was set up near the village of Boulmer to divert German attacks from nearby Royal Air Force (RAF) airfields such as RAF Acklington. As the air threat to the United Kingdom receded, the decoy airfield, with its grass runways and plywood and canvas Hurricanes, was abandoned. In March 1943 RAF Boulmer was re-opened as a satellite airfield to house the advanced flights of No. 57 Operational Training Unit RAF (a Supermarine Spitfire training unit based at RAF Eshott, Boulmer’s parent unit). During this period, there were three tarmac runways and a unit of the RAF Regiment defended the Station. In November 1943 RAF Boulmer became home to No 9 Battle Training School, in which night flying, dive-bombing, strafing, bouncer, and chase tactics were taught. As the war ended the airfield closed, reverting to agricultural use. Part of the airfield formed the basis of a caravan site with the runway and taxiway being used as an access road to the site. The site remains and is called Seaton Park. (wikipedia). NOTE: The above image is a rendering. This entry was posted in ABDUCTION, MISSING TIME, UFO, UFO ARTICLES and tagged ABDUCTION, ALIEN CRAFT, boomerang, chris holly, close encounter, comets, debunkers, DISC, discoveries, england, erratic movements, FLYING SAUCER, ifo, JULY 1977 RAF BOULMER, KEN PFEIFER, LIGHTS, meteors, military, MISSING TIME, MOON, MUFON, NORTHUMBERLAND, ORBS, pfeifer, TRIANGLE, U.K., ufo, uso, v-shape, worldufophotos, worldufophotosandnews by KEN PFEIFER. Bookmark the permalink. I simply want to mention I am just newbie to weblog and definitely liked your web page. Most likely I’m planning to bookmark your website . You really have fantastic stories. Many thanks for sharing with us your web-site.